Below is a drawing of our corral. Mark from ISU asked for more information on our corral. Thanks Jammer for helping with Autocad. Dad spent all of one winter studying a book of corral designs. He built his own design the next summer. We have used it for over 25 years and there isn’t a lot we would change. There is an exterior gate between #2 and #1 and an exterior gate between #8 and #9. 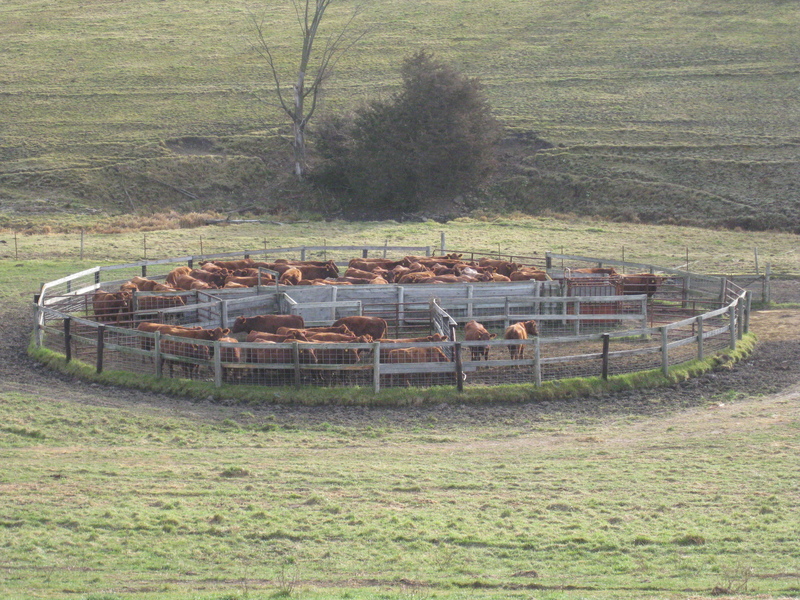 Gates open so that the corral could be used as a circular riding arena. I will describe how we use the corral to preg-check the cows. Cattle are lured into the large alleyway, #1, with hay or walked in using low-stress stockmanship. Gates are opened from the exterior into #2, and through #5, #3, and #4. Cattle are walked using pressure from at least three people from #1 to #2. By the time we get the exterior gate shut, cattle are beginning to move into #3 and #4. I run around and shut the gate between #3 and #5 to keep too many cows from crowding in. When the veterinarian arrives, I move all the cows except for about fifteen back into #2. Fifteen cows are now in #3. And #4 is empty. I now walk two cows at a time into #5 and #6 which has a crowding gate and they go down the alleyway into the catch chute, #7. One or more cows stands and waits in the alleyway with a bar behind her to keep her from backing out. When the system is working well, I’m slowly bringing in more cows as the vet. is preg-checking them. One person is helping move the cows down the alleyway while standing in #10. If a cow is bred, she is vaccinated and turned back out into the pasture. If a cow is not bred, (open), she is moved into #4. At the end of the day we can load the open cows using the alleyway or back the trailer into #10 and load there. Ok, this is quick and dirty. Comment if you have questions and I will clarify. This entry was posted on Wednesday, February 3rd, 2010 at 12:33 pm and is filed under Curious cattle. You can follow any responses to this entry through the RSS 2.0 feed. You can leave a response, or trackback from your own site. Thanks for sharing this corral design–it’s quite compact and efficient. Kudos to your father for the design. Do you have rough measurements on the main layout? Thanks Philip! The corral measures eighty feet in diameter.